2,021 backers pledged $203,677 to help bring this project to life. 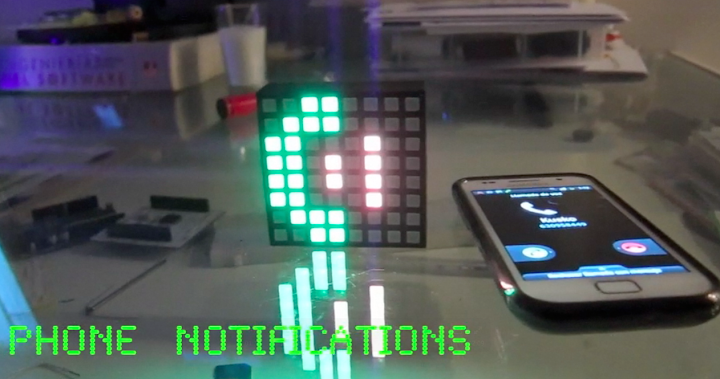 Mashable - "This unusual and useful box can silently notify you of just about anything that happens on the Internet... you’ll be surprised at all it can do"
CNET - "One box and 65 LEDs make getting your e-mail, smartphone, and social-networking alerts a whole lot more fun with a whole lot less noise." ANDROID RUNDOWN - "The incredible amount of uses for this device are what really make it one of the best KickStarter projects I have seen". Designboom - "The L8 smartlight serves an a illuminated notification system and customizable light display..."
Ubergizmo - "if sounds, drop down or pop up notifications aren’t enough to capture your attention, then this Kickstarter project dubbed the L8 SmartLight might be something worth checking out..."
Trendhunter - "Another distinct feature is that instead of communicating with sound, such as an alarm clock, this device solely communicates with symbols, which is ideal for the hearing impaired." 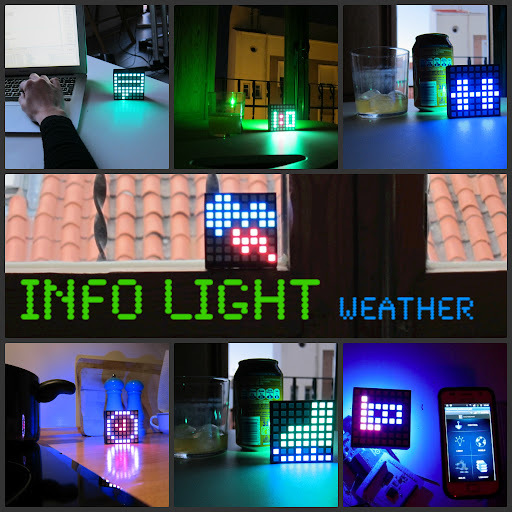 Gadgetsin - "L8 SmartLight is an innovative LED Light designed to offer you an awesome way to express your mood and receive various info and notifications from your smartphone or computer..."
Project your life, Use your light. 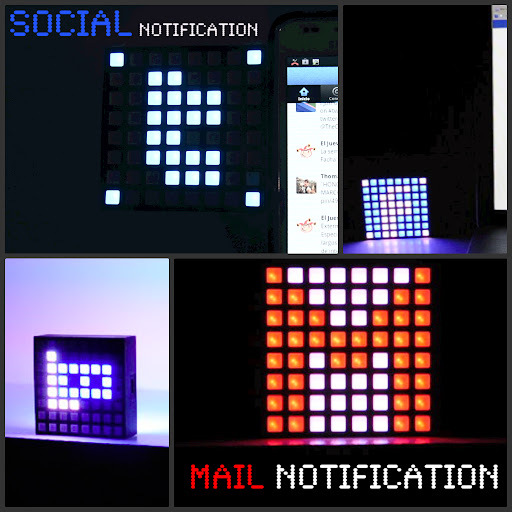 L8 is a battery powered mini squared lamp with a multicolor 64 Led matrix on one side and a multicolor super bright Led on the other and several useful sensors, that connects via bluetooth to your smartphone to notify you by light images or animations of just about anything that happens on the Internet: Twitter and Facebook messages, e-mails, game results, outside temperature…. in other words, If exists... it can shine in L8. Being connected with your Smartphone means that L8 alerts you as soon as you receive messages and incoming calls, and it functions as an alarm clock. The L8 also informs you of what’s happening in your surrounding WORLD and shares it with everyone else. You can find out the exact temperature in any room of your house; know if someone has entered in; or have your L8 light up when there’s very little surrounding light. From a friendly mobile application, you’ll choose the uses but you’ll also be able to create your owns since the programming code is open so that anyone can modify or improve it to fit their needs. And all of this is stress-free since the information goes directly from your computer or Smartphone, no matter where you are. 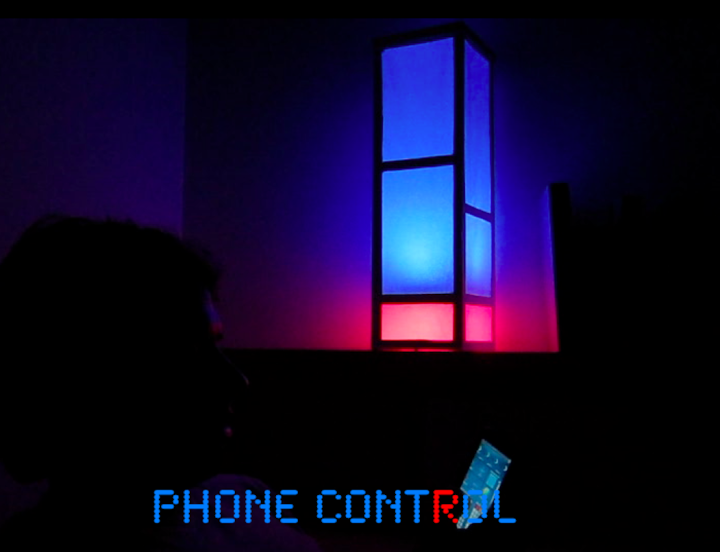 Choose the colour of your LED lights, create a unique ambiance by controlling both, tone and intensity, which combined with the super LED (very powerful) light at the back of the device, it will create a light-decor effect you won’t believe. 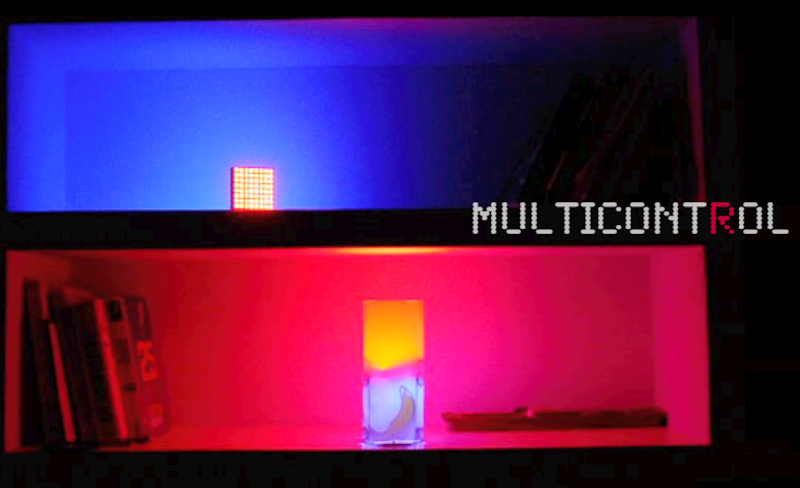 Or if you prefer, you can also project animated series of lights (for a party, for example). You just have to choose among the wide gallery or design your own series of lights! No noise; talk through light… Communicate with those around you by letting them know what mood you are in.. feeling blue?, your team colours…. you name it. You decide what image you want to put on your L8. Lots of designs are available in the gallery, download it from the internet, or be creative and design your own! Thanks to its connection to the internet through bluetooth, you can post and share your L8 image icons through social networks and see your contacts’s images too. The programming SDK code is open for anyone to develop and to add new applications, features or accessories to the L8's experience. Together, we can do it better. 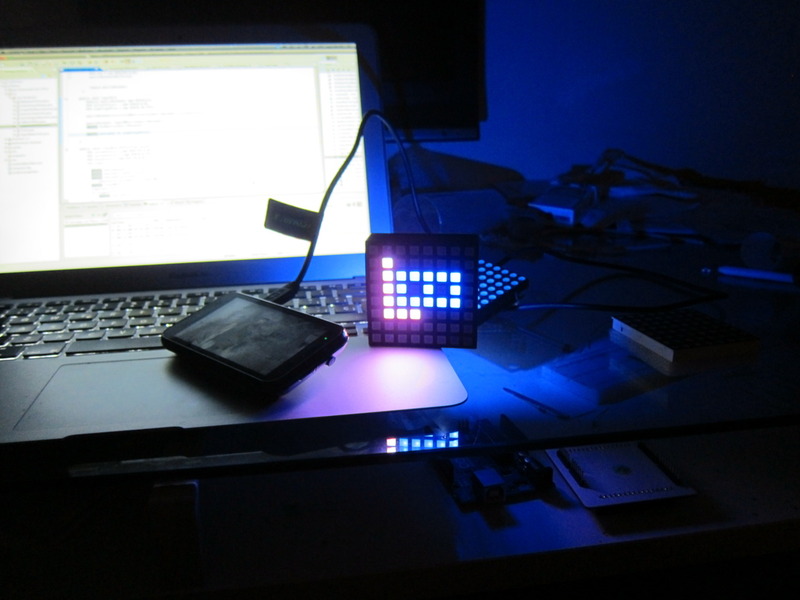 L8 is comprised mainly of a Bluetooth chip and proximity, temperature and light sensors, connected with a 64 RGB LED Matrix on one side and a Super RGB LED on the other. It has a long lasting lithium battery that gives up to nine uninterrupted hours of use and can be recharged easily through a normal USB port. 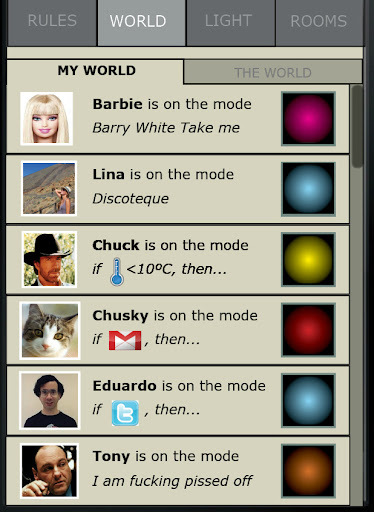 With the “L8 Controller” application (available soon for Android, iPhones/iPads and computers), you can control your L8 and program its functions to your liking. 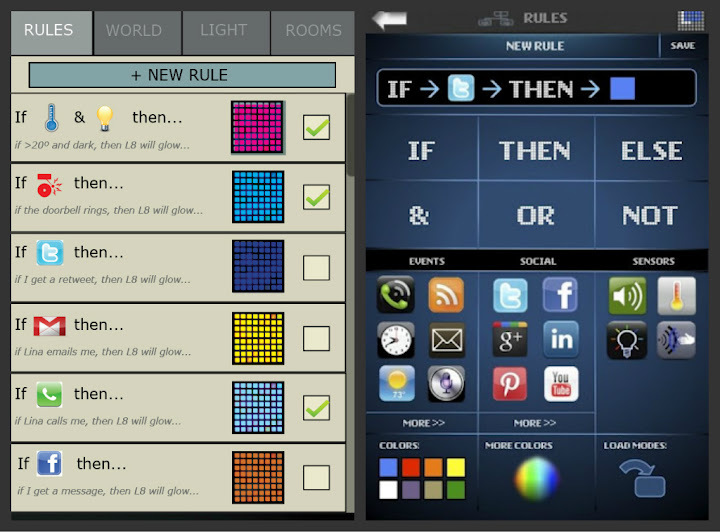 You can also set rules based on “If / then /else" filosofy, in which you choose the moment to communicate something (like a Twitter message, for example) and you assign it a particular luminous signal on your L8. 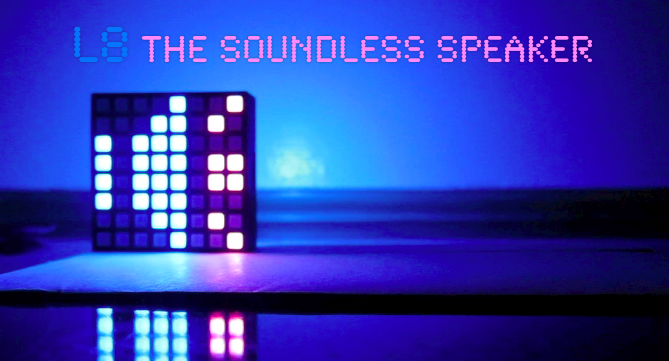 Thanks to its built in sensors and its Bluetooth connection (enabling it to inherit the ones from your smartphone: voice recognition, microphone, accelerometers...), the possibilities are unlimited! Rules system: "If This - then-->Light"
If you are a mom and you want to activate a luminous alarm instead of using noise while your baby is peacefully sleeping close to you to avoid awakening him. If you are a deaf person and you want to become aware of everything your smartphone receives. If you want to have your own remote and totally customizable ambi-light behind your TV. Even making it to be activated when you come in to the living room! If you want to place it in your porch, garden, to be used as a light that changes its light colors or intensity based on the daylight. If you want to enhance or highlight whatever decoration object you have, to provide it with a specific color light that matches with the surrounding style! 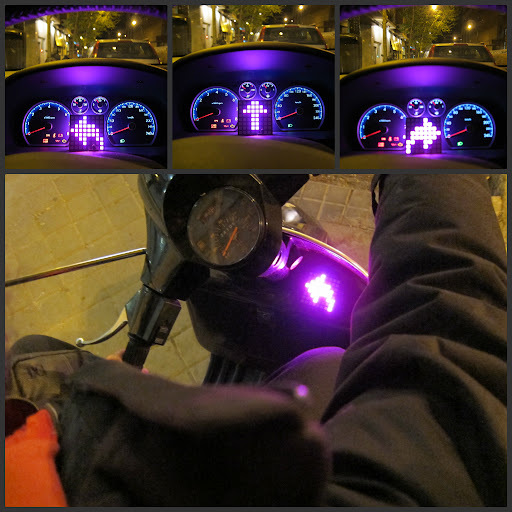 Imagine holding a L8 in your back while you are riding in your bike… it would be the perfect positioning and customizable light! Or even placed in the back of your car to communicates with other cars… maybe it would be illegal, but sounds well!! Try the Simul8tor and the Anim8tor and create new 8x8 images or animations (8bit style, as shown in a real L8) and share them on Facebook and Twitter!! Where we are and next steps? Since we have started with the idea one year ago, we have worked to explore the alternative techniques and tried to imagine all the opportunities of this kind of Smart Thing gadget. We have been working hard to create several different prototypes in the last months, to be sure about the viability of the project. Now we have the L8 version 0.3 and we are very proud of having achieved it. But we still have to keep on working hard to complete such an amazing product as it is!! L8 V 0.2 with our own design board! Leveraging on our expertise in hardware and software development, we've dedicated over a year creating working prototypes and near-final forms. We are truly excited about getting the L8 into people's hands to see what new uses and application others will find for it. We are convinced that the best ideas are yet to come! Our Kickstarter project will fund final refinement of our prototypes and the equipment and parts needed for production. The more funds we raise, the quicker we'll be able to add new features that make the L8 even more powerful and genuine. We have big things planned — and because it’s programing SDK code and API will be open to everyone to develop anyone will be able to help us improve it. Final enclosure design with its add-ons and production tooling. First production run (large component order). And produce at least 1000 L8, but above all, we want your help to make L8 SHINE. Together we can do it !!!! Led key chain with L8 Logo. T-Shirt with reflectable L8 logo. L8 Developer Edition. Early access to SDK + Led key chain with L8 logo. L8 Special Pack : 1L8 + Led key chain with L8 logo + T-Shirt with reflectable L8 logo (Free shipping USA & Spain , add $15 for international shipping). L8 Home Pack : 3 L8 + free Led key chain with L8 logo (Free shipping USA & Spain , add $15 for international shipping). L8 Coffe Pack : 8 L8 + free Led key chain with L8 logo + free T-Shirt with reflectable L8 logo (Free shipping USA & Spain , add $15 for international shipping). L8 Bar Pack : 13 L8 free Led key chain with L8 logo + free T-Shirt with reflectable L8 logo (Free shipping USA & Spain , add $15 for international shipping). 55 x L8 + Led key chain with L8 logo + free T-Shirt with reflectable L8 logo. Add 66$ for each L8 more. (Add $10 for shipping to USA & Spain, add $70 for international shipping (for the whole package)). 89 x L8 + Led key chain with L8 logo + free T-Shirt with reflectable L8 logo. Add 65$ for each L8 more. (Add $15 for shipping to USA & Spain , add $100 for international shipping (for the whole package)). 144 x L8 + Led key chain with L8 logo + free T-Shirt with reflectable L8 logo. Add 64$ for each L8 more. (Add $18 for shipping to USA & Spain , add $110 for international shipping (for the whole package)).